Here it is, my final analysis of Ocarina of Time characters before I move on to characters from Majora’s Mask. A small compilation of some of the more significant side-characters, each individual analysis will look at a single aspect of each character/s, and explore the possible causes for each aspect. So without further ado, let’s get straight into it! Getting straight into it, let’s start with Malon. The aspect I have chosen to explore with this character is hotly debated topic of the relationship between Malon and Link. Some people believe there is chemistry between the two, others are almost offended by the idea, and then there are those who simply don’t care. Link firsts meets Malon in the Market out the front of the castle, where she first refers to him as ‘Fairy Boy’, and reveals that her father went to deliver milk to the castle and has not returned. Link then continues onward to the castle, and after a failed attempt at getting into the castle, she asks Link if he could find her father for her, and gives him the Weird Egg. When Link finds Talon, Malon’s father, he can use the Cucco that hatched from the Weird Egg to wake him, and send him running madly back to his daughter. Later, when Link goes to Lon Lon Ranch, Malon introduces you to Epona, and when seeing that Epona doesn’t like him, she teaches him Epona’s Song. Malon giggles a fair bit as she talks to Link, which could stem from her liking him, and she’s giggling because she’s slight embarrassed that she came back to see her, but I believe it’s purely because she’s such a happy individual, and yes, she does like Link, but not in a romantic sense. Seven years later, Link returns to the ranch to find that Talon has been kicked out by Ingo, and that Malon still works there out of fear that the horses would be treated badly if she left. When Link bests Ingo in a race twice, and Link escapes the ranch with Epona, Ingo mysteriously goes back to being a normal person, and with Talon on his way back to the ranch, Malon is temporarily in charge, and is very grateful toward Link for restoring peace to the ranch, and states that she owes him a lot because of it. And that’s as far as it goes, I believe. Malon doesn’t love Link, they are simply friends. This is reinforced by a Gossip Stone saying that Malon dreams that a knight will sweep her off her feet one day. She dreams of a knight, not Link. Given what Link goes through in Ocarina of Time, he could fit the role of the knight, and there could be something more between them, but from what actually happens in the game, I don’t think so. Or as most you would know him, the guy with the gramophone. 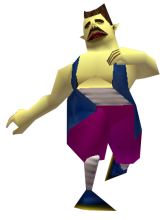 In Majora’s Mask, the Windmill Man’s alternate is called Guru-Guru, and in both incarnations, he has an obsession with his gramophone, and in general, things that go around and around. 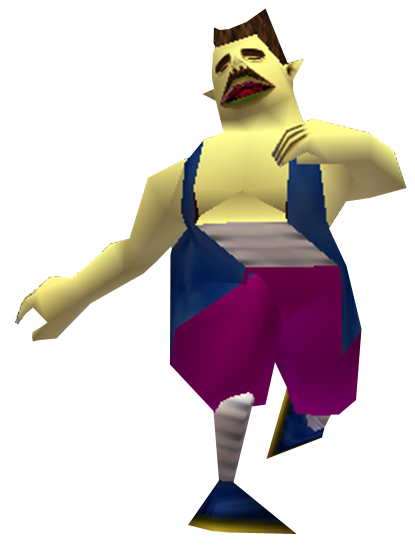 But due to referring only to the Ocarina of Time incarnation, he shall be referred to as the Windmill Man. As I said in my editorial on the Rabbitland Rescue Man, obsession is caused by constant exposure or use of an object, so in this instance, it would appear that when he was just a child, the Windmill Man was annoying his mother, and to distract him, she placed him in front of a gramophone to entertain him. Bad move, lady, because now your one action of good intent has scarred this poor boy for the rest of his life. This obsession of the Windmill Man could’ve also been caused by something else that went around and around, and he later discovered the gramophone and focused his obsession on that, but due to the fact he is trying to come up with a musical theme to describe the motion of the windmill, I prefer to think that his obsession stemmed originally from the gramophone in some way, possibly the reason given above, or some other way. There are three things peculiar about the Carpenters: why their leader, Mutoh, finds it necessary to frequently stretch his jaw muscles (is he shouting, yawning, something else? ); their exaggerated movements; and the reason why four of them (all men), felt they would be accepted into an all-female band of thieves. 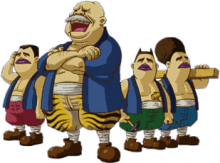 Well, one of the carpenters tells you that he wishes for an easier, better-paying job, the reason they tried to join a band of thieves, despite gender; Mutoh could be shouting at them when they’re working, and yawning when they’re not; so let’s take a look at their exaggerated movements. As indicated by the picture, they like to hop, skip, and jump their way through the world. People might just pass this off as saying they’re gay, but that’s stereotyping and discrimination, so no, I think it is actually connected to that one carpenter’s desire for an easier job, with no relevance to their sexuality. Skipping can be seen as an act of not caring what others think of you, and of freedom and happiness. This leads us to think that perhaps as children, the carpenters experienced a boundless freedom, when life was easy, and upon being imprisoned by employment, it is their one outlet to release the tension of desiring freedom during constant work. In conclusion, I would like to add that in my last editorial on Ocarina of Time bosses, I didn’t include Volvagia because I feel the dragon is pretty straight forward: a thousand years ago, the unnamed Goron hero put the hammer down on its skull and killed it. A thousand years later (in the present setting for Ocarina of Time), Ganondorf resurrected it, and the new Hero of the Gorons, Link, put the hammer down on its skull and killed it. So what do you guys think? Where do you stand on the relationship between Malon and Link? What do you think caused the Windmill Man’s obsession with the gramophone, and things going around and around? Why do you think the Carpenters have such exaggerated movements? Let me know in the comments.